This wedding gift cross is carved from poplar and is approximately 10 inches tall. The composition is inspired by the story of the wedding at Cana from the book of John 2:1-11. 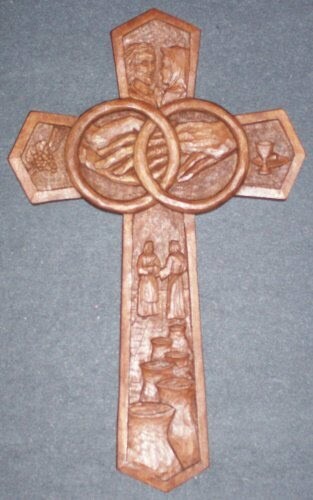 In the center we have interlocked rings over clasped hands. On the left, are wheat and grapes. On the right are bread and wine. At the top we have Jesus being told by his mother Mary that the wine has run out. On the bottom, we have one of the servants and the chief steward marveling at the wine from the stone water jars.